A P10-BILLION international port will soon rise in Talisay City. 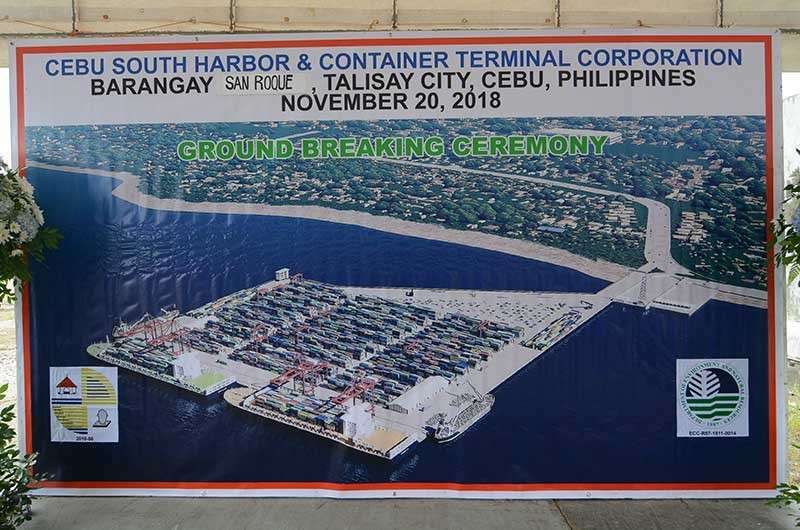 The Cebu South Harbor and Container Terminal Services Corp. (CSHCTSC) will cater to containers and break bulk cargo operations, and is expected to generate hundreds of jobs for Talisaynons. Cebu Port Authority General Manager Angelo Verdan said the port will be leased by the CSHCTSC for 25 years and that it was initially funded by the Department of Transportation, the CPA’s mother unit. Verdan said that since the vicinity of the port is too shallow for vessels to dock, the private concessionaires will reclaim 25 hectares in waters off Talisay City, with the proper permits from the Philippine Reclamation Authority. He said that while this port will compete with Oriental Port and Allied Services Corp. (Opascor), both have their separate markets. Verdan said that Opascor, the exclusive labor service provider, has an ongoing P1.1-billion construction of a finger port to augment the existing Cebu International Port (CIP). According to Cecile Bitare, consultant of the CSHCTSC, the private and commercial port will be a state-of-the-art facility that will be a gateway for international ships. “It will augment the flow of imports and exports. That will stimulate the growth of industries and sustain the economy of Cebu, with the expected increase in commerce. It will put Cebu in the arena of international ports,” she said. The undertaking will reinforce the “Build, Build, Build” program of the administration, Bitare said. “The CSHCTSC will build a mega-world harbor facility in this area of the sea through back-filling,” she said. Construction is set to begin in early 2019 and is targeted to be completed in 2021. The port will also decongest the CIP by providing another choice for port users, shipping lines and shippers. “This port will cut the waiting time of ships, as it will supplement today’s berths at the CIP. Ship agents or shipping lines will realize reduction of vessel call costs if they are served immediately,” she said. The port will have an area intended for reefer ships that are meant to transport perishables, and will support local suppliers of these products. “We do not have many reefer shipments going out of Cebu. But because of the perfect location of Talisay, we see the big possibility of this port to function as a transshipment port, not only for dry cargo but for local products requiring refrigeration like ice cream, meat, fruits and even flowers,” she said. It will also provide a truck holding area to accommodate trucks with pending business transactions, Bitare said. Two warehouses will be built and may also be offered to logistics firms intent on doing hub distribution from Cebu, as it will provide warehousing spaces for bulk materials and other cargo. Bitare said they are also closely working with the Bureau of Customs (BOC) for the port to have its own Customs district where all import processing, payment of duties, taxes and clearances for pullout will be done. The groundbreaking ceremony was marred by a rally staged by about a hundred fisherfolk, asking for alternative livelihood. They said their fishing ground will be affected by the construction of the port. (see separate story, page 4). Presidential Assistant to the Visayas Michael Dino said the construction of the port is timely, considering the clogged domestic and international ports in Cebu.